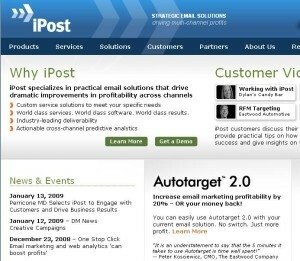 iPost is a leading email marketing software company specializing in practical email solutions that drive dramatic improvements in profitability across multiple channels. iPost has engaged TopRank Online Marketing to develop a holistic Search Engine Optimization (SEO) and Blog Marketing program to increase search engine visibility within a highly competitive market. TopRank Online Marketing is an online marketing and public relations agency in Minneapolis, MN providing Fortune 500 companies with consulting, implementation and training on search engine optimization, social media marketing and digital PR.